There’s been a lot of buzz recently about smart technology in factories, dubbed Industry 4.0. In a recent BCC Research webinar, I shared our research about how the Internet of Things (IoT) is at the foundation of improvements in the smart factory, increasing efficiency and lowering costs. IoT technology is the next paradigm shift caused by computer technology, as computers become smaller and more powerful: from mainframe computers, to PCs and more recently mobile devices. While IoT technology in factories shows great promise, it’s still in the early stages of adoption. 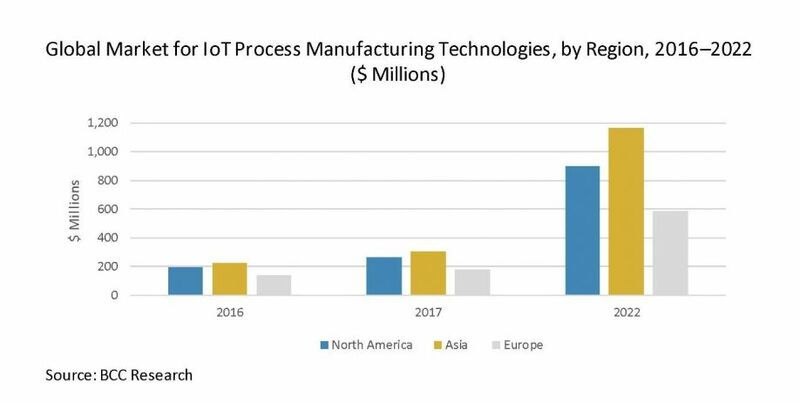 According to our recent report Internet of Things (IoT) Technologies for Process Manufacturing: Global Markets, many parts of this landscape are fragmented or are just emerging. Startups have flooded the market; network elements—particularly wireless ones—are still being developed; new sensors are emerging, and companies are layering virtualized software over existing PLCs and Distributed Control Systems (DCSs). 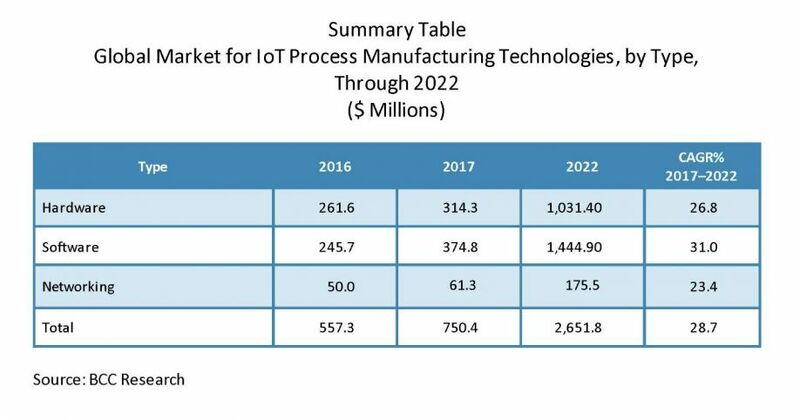 The report examines the technology by software, hardware and networking elements, all of which comprise the IoT system in a process manufacturing plant. While each of these segments is forecast to experience strong growth over the next five years, networking has some of the greatest challenges and is growing somewhat slower at a 23.4% compound annual growth rate (CAGR). Software is forecast as the fastest growing market (31.0% CAGR) over the next five years; although hardware currently has the largest installed base. By 2022, the IoT Hardware segment is expected to reach $1.1 billion and is further segmented by sensors, Programmable Logic Controllers (PLC) and Distributed Control Systems (DCS). It has a large base of devices, and being cost conscious, we expect many process manufacturers to reuse these devices, as opposed to throwing them out, which will lead to significant investment in this area. Of the hardware, the sensor market is expected to be the largest market, reaching $911 million by 2022. Sensors are the means of collecting data, either internal (looking at the systems themselves) or external (looking at what is going on in the environment). The sensors market is fragmented with a wide range of vendors and a wide range of devices. The sensor market—and several other manufacturing markets—are being affected by regional shifts. Software is “where the action is” in the IoT space and is segmented by IoT platforms, Big Data and security. Within these segments, data—specifically Big Data—is forecast to have the largest growth, reaching $729.9 million over the next five years. Data storage provides an example of the challenges as well as the opportunities in IoT technology. Currently, the industry and the world produce 22 zettabytes of data annually, and these numbers are growing between 20% and 30%. Of the IoT technology components, Big Data is the “goldmine.” Manufacturing data analytics are helping manufacturers improve and streamline their operations and are what turn the information gathered from hardware and transmitted through the network into cost-saving actions. After generating data, the first order of business is moving that data from one point to another. In the manufacturing space, there are currently two major market segments for networking—wired and wireless—both with their unique advantages and both experiencing robust growth through 2022. According to our research, wireless is where everyone wants to go. However, a lot of this technology is generic, developed primarily for the consumer marketplace. Not all of this technology translates to the factory, and consequently, there are some enhancements that must be made to these systems before factories can use them. The Wi-Fi HaLow is one major development in networks and is facilitating factory communications. Furthermore, there is a lot of work with Bluetooth in this area, and there is still a lot of confusion or some disagreement about which is going to emerge over the next five years. In either case, paramount to the success of wireless technology is the development of communication standards. Wireless technology must adopt communication standards to allow multiple manufacturers to reside within the same network. Many industry experts anticipate the use of wireless applications to explode in the near future. 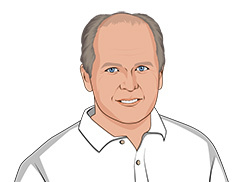 Paul Korzeniowski is a market research analyst with BCC Research and building automation consultant with more than two decades of experience. His work has centered on determining major market trends in the development of new networking standards, integration of building systems and the emergence of new technologies such as wireless communications. He has authored reports on markets for building automation systems for a wide variety of publications, including Investor's Business Daily, Business 2.0 and EnergyBiz.